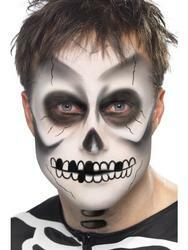 Show off those beautiful bones of yours with this spine chilling Womans Skeleton Masquerade costume. Included in this outfit is a highly detailing black sleeveless dress with white Skeleton ribcage print to the bodice and a tri coloured layered tutu skirt. Finishing this spooky look is a sculpted neckpiece designed to blend in with the bodice detailing, a pair of screen printed glovelettes, matching thigh high socks and the all important handheld masquerad face mask. Sure to have you making a huge impression this 31st October at a Halloween fancy dress party, why not complete the look by adding our Fallen Angel Wig?